“If you want a linguistic adventure go drinking with a Scotsman” starts one of Robin Williams’ iconic monologues. Some Scots speak English in a manner barely comprehensible to Americans, which is not all that funny, but Willliams performs in a nonsense brogue relying on gestures and emphatic stress, which is hilarious. It is how we perceive an unknown language. We rely heavily on stress, pitch, loudness and gesture to decipher meaning in our own language too. The data conveyed from sentence structure is only part of the whole communication. Some kids do not decipher non-verbal cues with the ease most of us can. They may not get that an eye roll means frustration, or someone looking away might mean they’ve lost interest in your conversation. Operating in a variety of social circles can be extremely frustrating, as social rules change from one context to another. The eye roll might mean one thing when joking with your sibling, but quite another when directed at a teacher. Kids are never explicitly taught non-verbal communication, because most pick it up intuitively. Teaching them to notice and translate social cues is part of pragmatic language therapy. Watching people who speak another language is an opportunity to practice noticing. This can be on a voyage abroad, or at home watching TV. Kids get to be detectives, focusing on people talking to each other. You don’t know what they’re saying but can you tell anything about the way they are feeling or what they may be discussing? How might they know each other? What does their body language tell you? Where do you think they’re going? If you don’t understand what they are saying you can’t rely on the data passing back and forth, and are left completely with context, tone of voice, body language and the way people present themselves. Foreign commercials work super well, as the music, action and voice give huge clues to what’s going on. Commercials have to get their message across quickly and visually. My favorite method for demonstrating how much is conveyed without using words is to make up a gibberish language and use inflection, eye contact, and gesture to impart meaning. I did this when my kids were kindergarteners. There were only 2 recognizable words we could produce, ‘hockey puck’ and only once per utterance. The more serious and earnest we were the sillier it became. We were laughing in no time, with as much abandon as we do now when seeing videos of Robin Williams. Posted in Uncategorized on September 13, 2015 by monicaplace2014. At 3pm I start to think about dinner. Usually I imagine sitting at the cozy French restaurant down the street with Prosecco in hand, fiddling with a garlicky appetizer. By 3:05 the fantasy disappears like the last madeleine on a cookie plate, and I’m back. Orthodontist appointments, after-school activities, phone calls, you all know the drill. Dinner becomes one of 4 meals in our family repertoire, my inner foodie is too embarrassed to elaborate. As my children struggle to plan, and get everything done in the 5 hours between returning home and bed, it occurred to me they could learn these skills while cooking for my husband and me. Anyone who’s put dinner on the table (from scratch) a few nights a week knows what I’m talking about. It’s so natural to turn the oven on before placing the chicken in the roasting pan, you don’t think you are planning ahead. But you are. Executive function (EF) refers to a cluster of abilities, which allow us to work towards a goal, persist, and be flexible with changes along the way. (These qualities do not fully mature in us until we are in our young 20’s, so cut your kids some slack). For many it’s not easy. We get distracted, have a limited sense of time, are discouraged by variations along the way, or lack materials necessary to achieve our goals. EF directly impacts performance in school. It requires, working memory, inhibition, planning, attention, and monitoring. The good news is, children unknowingly work on these abilities everyday. And as a parent you can provide opportunities to encourage this thinking. If I want to get fancy about it, cooking is essentially a ‘therapeutic activity for executive function,’ but for us parents the incentive is two-fold: create ways for the kids to get confident of new abilities and, get them to make us dinner! Why is cooking a perfect activity to practice EF? Timing is essential, you may not always have the right ingredients, and it helps to be flexible when your rice is soggy or you mistake salt for sugar. 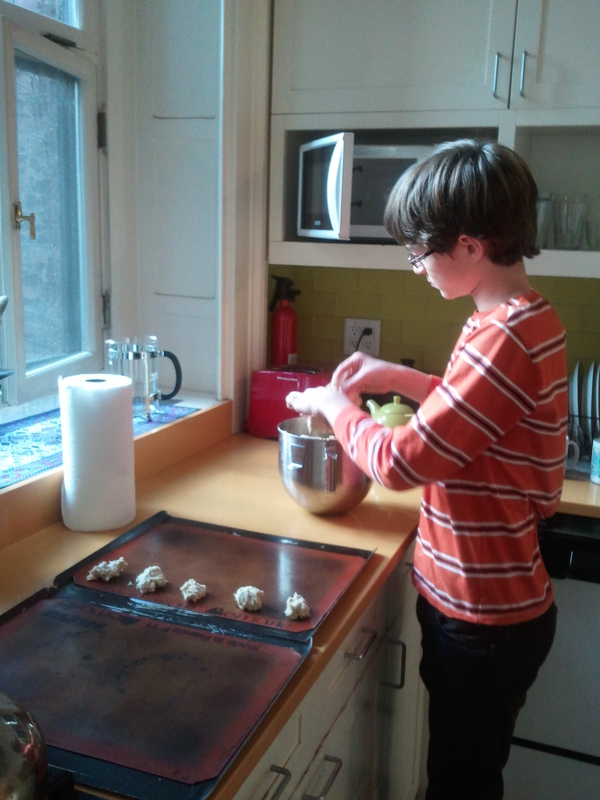 From preschool through high school, your kids can cook. The effort you put in pays off in time saved and delicious (sometimes unusual) meals. Toddlers can break eggs, fill muffin tins, and gather ingredients. Older kids can get a proper meal on the table. 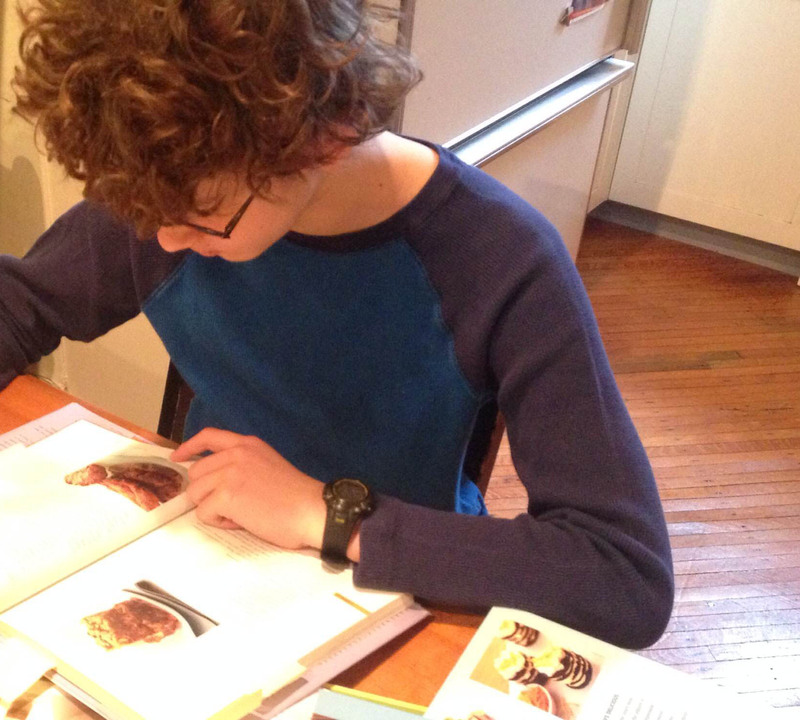 In my effort to get my boys cooking, I put a few cookbooks on the kitchen table asking them to pick a recipe. Having a photo of the completed dish is essential, as they need to have the end product visualized before they plan. Never mind that Son #1 picked Spring Vegetables with Pea Shoots, while snowflakes twirled in the updraft out our window. Son #2 picked Mexican Chocolate Mousse, Butterscotch Sundaes and Boston Cream Pie. Fire up the oven, this sounds like my kind of meal! Reading the recipe and gathering food. Writing an ingredient list for items we do not have. This involves checking fridge and cabinets, and getting to know what’s in the kitchen. Buying the food. If your kids are too young you will do this, but if they can go to a friend’s house alone, they can buy groceries. Warning: the first time they go shopping they will get something wrong. Count on it. That’s ok. EF involves flexibility. Use the dried mint instead of fresh or the margarine instead of butter. Read the recipe again. This will help familiarize your kids with the method/plan. Working Memory— recalling what you’ve done and what is left to do. Referring to the recipe when needed. Attention— for example noting when scrambled eggs are cooked, butter is melted etc. Inhibition—trying not to eat all the chocolate chips before they go into the batter. Please. Monitoring —is the water boiling? If so it means the pasta is ready to dunk. Is it faster to cook by yourself? YES . . . at first . . . however your kids will enjoy the food more and be incredibly proud. It goes faster the 2nd 3rd and 4th time, until you can be at your computer buying strappy sandals and your children will pop in to ask, ‘do we have any balsamic to deglaze the pan?’ This hasn’t happened to me yet, but I live in hope. In the meantime be ok with eggshells in the frittata, flour on the floor. 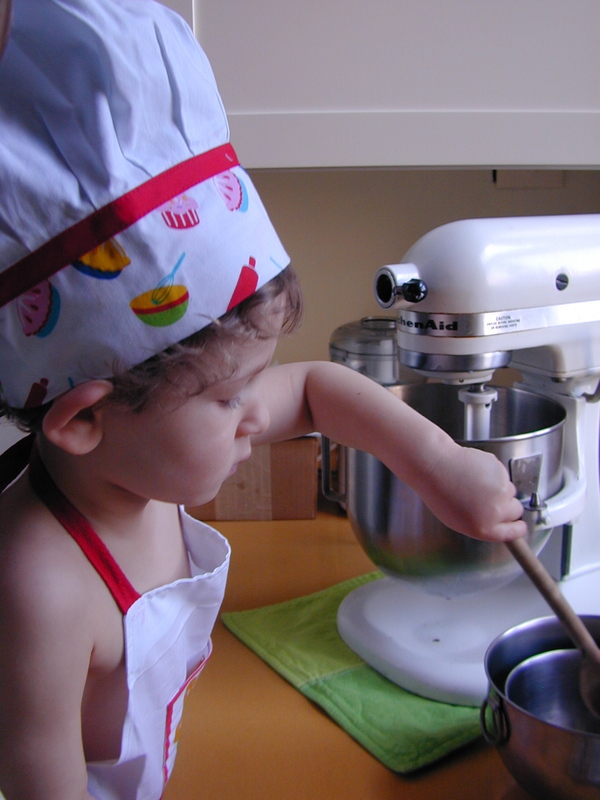 Beyond the EF benefits, cooking is a skill your kids may use their whole lives. Why not give them one more reason to be appreciated and help your family roll along its merry way. Posted in Uncategorized on January 25, 2015 by monicaplace2014.